Focus on making yummy Halloween party food now that you have your Halloween costumes ready and house decorated. In this section you will find great and easy recipes for drinks, cookies, cakes and other sweets. You will find Ghost Meringues, Pumpkin Cookies and Halloween Sugar Cookies. This is the place for Yummy cupcakes recipe, Pumpkin Pie, Pumpkin Cake and Cream Cheese Icing. Non alcoholic child friendly Hot Golden Cider, Orange Cream Punch and Red Punch Float. 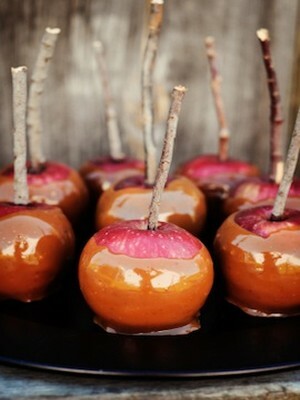 Since Halloween occurs during apple harvesting season, candy apples (aka caramel apples) are a traditional treat during the holiday. This sweet was created in the 1880s by George Renninger of the Wunderle Candy Company. It is made out of sugar, corn syrup artificial coloring and binders. 1. Pumpkin are native to North America and are harvested in October, just in time for Halloween. 2. Pumpkins are a fruit and not a vegetable. 3. During Halloween people carve Jack-O-Lanterns out of pumpkins and use them for baking pies and cakes. 1. During the Middle-Ages on the evening of Hallowmas, the poor dressed up in costumes and went around door to door begging for money or food in exchange of prayer. 2. Usually they were given a Soul Cake, which is a small round cake representing a soul being freed from Purgatory when the cake is eaten.